Wow, this guy is FAST! Have you heard about runners who are so fast they can actually run across water? 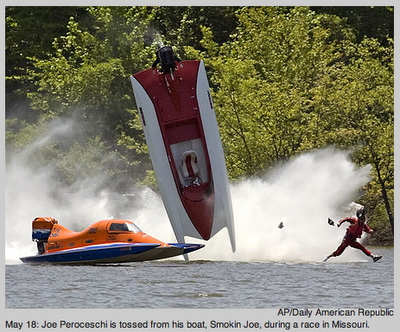 Here’s a guy beating two speedboats! Okay, that’s a little silly, but it is an absolutely amazing photo! I noticed that the photographers name wasn’t even mentioned, just “AP/Daily American Republic.” Bummer! Any photographer is really honored to have their name and/or website given credit for photos and whoever took that photo deserved to have his name mentioned! Thanks to my brother Sean who forward a link to the story. You can see the original Fox News story here if you’re interested. I’m back from two weekends in a row in the Dallas area. The 400-mile round trip is starting to look familiar. =) Should have some photos to post soon from previous weddings… I’m still playing a bit of catch-up.